Contains 85% fresh meat and offal. My dog loves this and her coat has become much softer and nicer since I changed her diet to raw food. 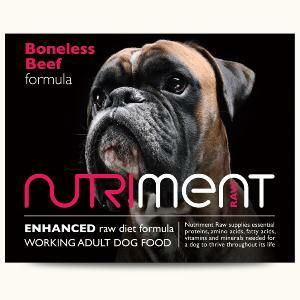 This is my dog's favourite of the Nutriment range. Her coat has become much softer and glossier since I changed from a dry food to this raw diet. This is my dog's favourite of the Nutriment range. My dog can't get enough of this.